Definition at line 65 of file Options.h. Definition at line 173 of file Options.cc. Definition at line 178 of file Options.cc. Definition at line 183 of file Options.cc. Definition at line 188 of file Options.cc. References SBuf::cmp(), debugs, extensions, SBuf::length(), name, wordlist::next, and SBuf::substr(). Definition at line 209 of file Options.cc. References add(), NULL, strListGetItem(), xfree, and xstrndup(). Definition at line 227 of file Options.cc. References debugs, extensions, name, and wordlist::next. Definition at line 78 of file Options.h. Referenced by add(), matches(), report(), and ~TransferList(). Definition at line 80 of file Options.h. Referenced by Adaptation::Icap::Options::Options(), and Adaptation::Icap::Options::transferKind(). 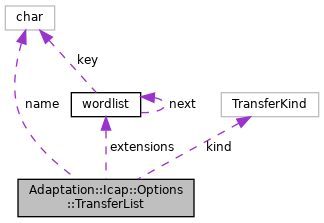 Referenced by Adaptation::Icap::Options::cfgTransferList(), matches(), Adaptation::Icap::Options::Options(), report(), and Adaptation::Icap::Options::transferKind().